An incomplete copper alloy probable great square headed brooch fragment, of Early Medieval dating (c. AD 450 to c. AD 600). Less than 25% of the brooch is present, consisting only of part of the bow and a small amount of the head plate. The rest of the brooch is missing, presumed lost in antiquity. The brooch fragment is sub triangular in plan, and curved in section. All edges are incomplete. The decoration on the front can be separated in two parts: the bow and the square plate. The bow is decorated with a central rectangular ridge, which has been decorated with two parallel grooves (worn in the middle of the bow). Diagonal double grooves are present at the top and bottom of the bow on either side of the central ridge. A raised ridge is present along both edges. The decoration on the head consists of two raised circles at the junction of the bow and the plate, with a triple stranded ridge extending above it. A double stranded ridge is present at the possible top of the plate running at right angles to the vertical ridge. The reverse is plain and undecorated. The remains of two pin lugs with an iron axis bar, for the pin to attach to, are present on the reverse. It measures 46.4 mm in length, 22.8 mm wide and 13.9 mm thick (at the bow). It weighs 15.5 g.
The brooch is a mid brown colour and an even surface patina. 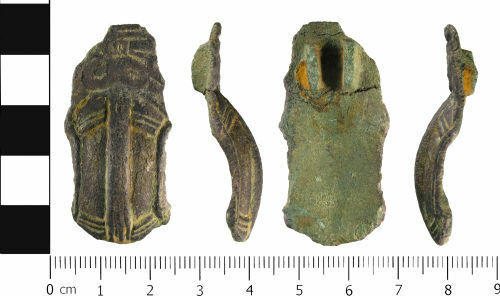 Several similar great square headed brooch fragments have been recorded on the PAS database, including: WMID-E96A51 and WMID-922C17.